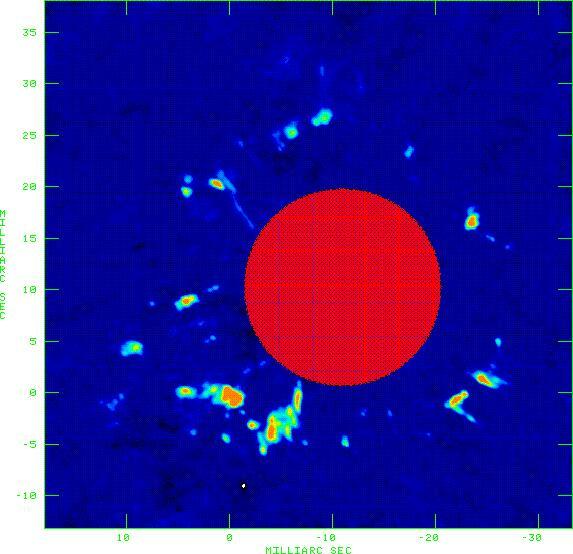 Astronomers at the National Radio Astronomy Observatory (NRAO) have used the continent-wide Very Long Baseline Array (VLBA) to map for the first time the magnetic field on the surface of a star other than the Sun. Their detailed images reveal a highly ordered magnetic structure. Athol Kemball and Philip Diamond, of the NRAO in Socorro, NM, observed the star TX Camelopardalis (TX Cam) with the VLBA, a National Science Foundation radio telescope system that allowed them to observe unprecedented detail in the star's atmosphere. TX Cam lies about 1,000 light-years away and is about twice as massive as the Sun. The astronomers report their findings in the June 1 edition of the Astrophysical Journal Letters. Kemball and Diamond were able to measure the average value of the magnetic field strength around TX Cam. Their measured value is 5 - 10 Gauss, much stronger than the average 1 Gauss strength of the principal components of the Sun's magnetic field. The VLBA images also showed a remarkably ordered structure of the magnetic field lines. "This suggests that the magnetic field of TX Cam follows the lines of longitude on the star," says Kemball. This would mean that TX Cam's magnetic field is structured similar to those of the Earth and Sun, which resemble the field of a bar magnet, with orderly field lines running from one pole to the other. The VLBA observations provide the first evidence for an ordered magnetic field in another star. Every year, TX Cam, a star in the late stages of its lifetime, loses mass equal to one-third that of the Earth. "We don't yet understand the mechanism," Diamond says, "but the magnetic field plays a role." The star is losing mass from most of its surface, but, like the Sun, loses more from disturbed regions. VLBA observations of TX Cam and other stars have shown motion of the gas when observed at different times. With the VLBA's capability to make detailed maps of the star's magnetic field and to monitor the mass-loss process, the researchers hope to shed some light on this longstanding mystery of stellar physics. Stars lose mass throughout their lifetimes through different processes that are still poorly understood. Kemball and Diamond, having shown that the VLBA is capable of making images detailed enough to study one such process, plan further observations that will reveal changes in the star's magnetic field over time. "TX Cam is a variable star, like Mira, pulsing with a period of 557 days. We want to watch the changes in the structure of its circumstellar envelope and its magnetic field over an entire cycle," Diamond said. With the ultrasharp "vision" of the VLBA, they can make a "movie" of the changes and hopefully learn how the mass-loss process works. Such knowledge is important not only to understanding these stars but also to other problems in astronomy. For example, mass-loss from stars like TX Cam is second only to supernova explosions as a contributor to the interstellar medium, the tenuous gas and dust between the stars from which new stars and planets are formed. The researchers used the VLBA to look at radio emission coming from Silicon Monoxide (SiO) molecules in the outer atmosphere of TX Cam. 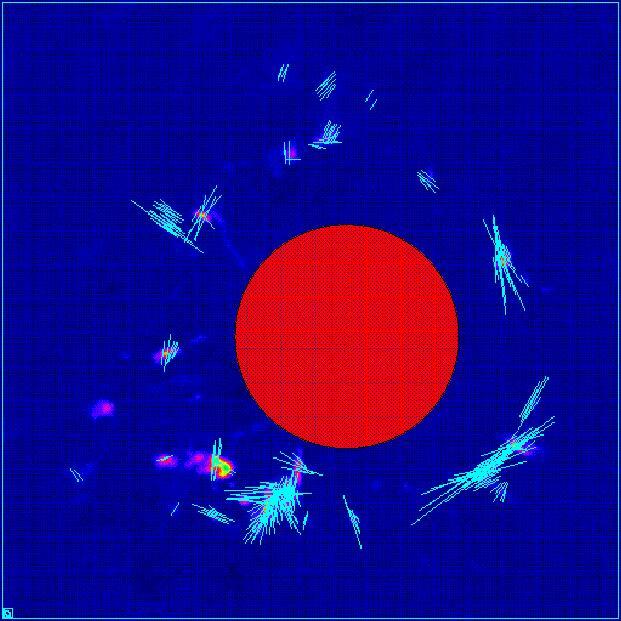 These molecules amplify radio waves in much the same way that a laser amplifies light. The result is "bright" radio emission from regions where conditions are right for molecules to amplify. The polarization of the molecules' radio emission indicates the orientation of the star's magnetic field. The SiO molecules form a shell around the inner portions of the star's atmosphere. The star's photosphere, or "surface" as seen in visible light, varies in size as it pulsates from about the diameter of Mars' orbit around the Sun to that of the asteroid belt. The shell of SiO molecules has a diameter about equal to the that of Jupiter's orbit. The ability to study these SiO shells in such detail provides researchers a "powerful new tool" for determining how the magnetic fields of old stars like TX Cam evolve over time and to learn what role their magnetic fields play in the mechanisms of mass loss. The VLBA is an instrument of the National Radio Astronomy Observatory, a facility of the National Science Foundation operated under cooperative agreement by Associated Universities, Inc. NOTE: Images to accompany this release are available on the National Radio Astronomy Observatory's anonymous FTP site at: ftp.aoc.nrao.edu, in the directory pub/press. The image files are: masers.ps and masers.gif; and polarization.ps and polarization.gif. MASERS (Above) VLBA image of the star TX Cam, showing regions ("spots") of maser emission from Silicon Monoxide (SiO) molecules forming a shell around the star. Approximate size of the star is indicated by red circle (artifically added to image). The maser spots are where the SiO molecules are amplifying radio emission at a frequency of 43 GHz. In separate images made at different times, these maser spots are seen to move. POLARIZATION: The same image as the previous one, but with blue lines added, showing the relative strength and orientation of the electric field vectors in the received radio emission. The orientation provides an indication of the orientation of the star's magnetic field. The magnetic field can be either parallel or perpendicular to these vectors depending on the angle between the magnetic field direction and the line of sight. In most of the inner parts of the star's atmosphere, the magnetic field is probably parallel to the surface of the star. In areas where this pattern is significantly disturbed, researchers believe accelerated mass loss is taking place.